From time to time clients, and those who would like to visit Haliburton Forest, question our rates, particularly as they pertain to snowmobiling. Our prices are compared to rates charged by ‘public’ snowmobiling organizations, such as the OFSC (Ontario Federation of Snowmobile Clubs), which in 2013/14 charges $260 for a seasonal permit to travel all public trails in Ontario. Haliburton Forest charges $450, $200 and $100 respectively (for other members of the same family) and $49 per day; whereas the OFSC rate is $75 for a 3-day permit. 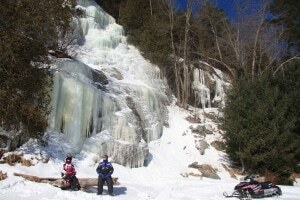 The OFSC is a public snowmobiling organization, while Haliburton Forest is completely private. Going back into the history of snowmobiling in Ontario, it all started with many private clubs in the late 1950’s and peaked with hundreds of private clubs and organizations throughout Ontario in the late 1960’s and early 1970’s. At that time, there were half-a-million organized snowmobilers in this province with over 100 companies producing snowmobiles in North America. Those were the hay-days of snowmobiling. Today, Haliburton Forest is the only remaining club/organization that never joined one of the regional or later provincial bodies. These were finally united in Ontario under the single umbrella of the OFSC in the early 1990’s. One benefit of joining, was the public support that they started receiving. 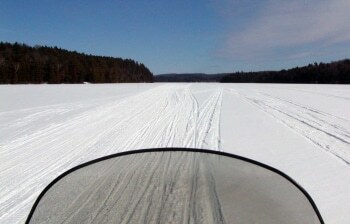 All levels of government realized that snowmobiling as a tourism business is good for the economy, and therefore poured funds (partially received from various indirect taxes on snowmobiling such as fuel, equipment or clothing) back into snowmobling, with the OFSC being the receiving public snowmobiling body in Ontario. Accordingly, the federal government over the past years has made many millions of dollar available for a variety of snowmobiling focused infrastructure projects. The provincial government over the years has provided tens of millions of dollar to the OFSC to provide grooming services. Even lower tier municipalities and counties assist snowmobiling with annual funding – direct or indirect. In the end, the $260 for a seasonal permit is not the full price paid by every snowmobiler, since their tax monies also pay for services – keeping these permit fees lower. It can even be argued that every Canadian, snowmobiler and non-snowmobiler, is supporting “public” snowmobiling in this country through taxes. I am sure that the removal of this funding *(which I don’t advocate) would result in permit fees well above those levied by Haliburton Forest at the moment. Another uniqueness to Haliburton Forest is the fact that we operate exclusively on our own, private lands, while the OFSC clubs often run on Crown lands as well as a multitude of private lands based on land-owner permissions. In these cases there is no “cost” to the OFSC to access these lands, where Haliburton Forest is subject to realty taxes as well as the cost of maintaining its own infrastructure, such as roads, bridges, shelters etc. Haliburton Forest also differs from the OFSC when comparing the average snowmobiling season: on OFSC trails it lasts 8–10 weeks. In Haliburton Forest, grooming commonly commences mid December and often does not stop until early April. That is an average of 16 weeks of snowmobiling in Haliburton Forest. Accordingly, measured on a weekly trail availability basis, the $450 per season charged by Haliburton Forest is exactly the same as the $260 charged by the OFSC for a shorter season, namely $30/week. Many customers choose Haliburton Forest for snowmobiling due to the superior quality of our trails (and this is no slight against the OFSC). The main reason why Haliburton Forest remained “private” instead of joining the then regional Ontario Trail Builders Association (a precursor to the OFSC) was the fact that as a solely private organization, we can do things, which are not appropriate for public bodies: Foremost is restricting of the number of riders on the trails. This move occurred at Haliburton Forest in 1999, when, after a very “successful” winter season, staff and snowmobiling clients alike claimed that Haliburton Forest would soon be a victim of its own success. 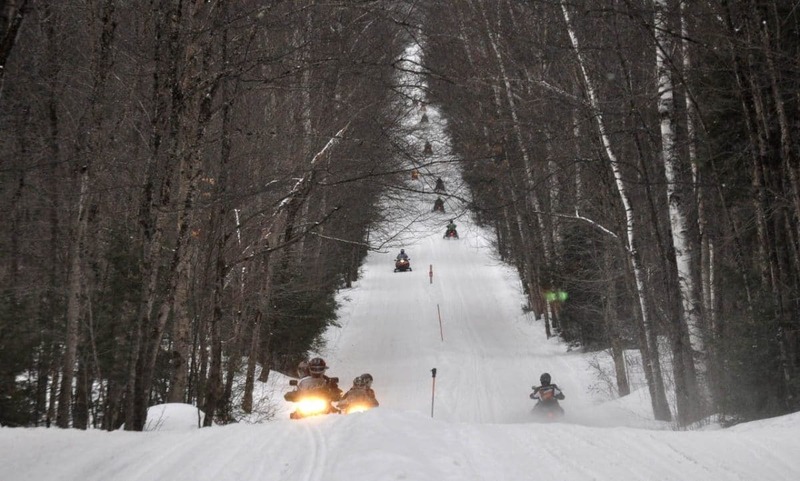 On some Saturdays, upwards of 800 snowmobilers were crowding the then 300 kilometers of trails at Haliburton Forest. Grooming could not keep up with this traffic and needed to be pushed increasingly into the night. Our infrastructure, from shelters and toilets to restaurants and parking, could not cope with this onslaught. Even more importantly, accidents were on the increase, with collisions becoming the prime reason. Today many OFSC snowmobilers using public trails on beautiful mid-winter weekends can relate to what I describe from our past. When I decided to limit the number of sleds on our trails from “unlimited” to “100” per day, most snowmobilers deemed this to be the end of snowmobiling at The Forest. But the contrary is true: today industry critics unanimously rate Haliburton Forest as one of the top snowmobiling destinations globally. The quality of the snowmobiling experience we can offer at Haliburton Forest due to a limited and controlled number of snowmobilers is second to none. And as everybody knows, and all of our customers accept, quality has its price. There are many more reasons why customers enjoy snowmobiling at Haliburton Forest: Haliburton Forest, as an integrated, multi-use forest, has been awarded numerous national and international acclaims, and has also invested diligently over the past 30 years in its snowmobiling infrastructure: We can boast a dry-land trail system of 300 kms, which is totally independent of (non-)frozen lake conditions. We have also been successful in operating 80% of our main trails on gravel-road bases, which make trail maintenance easy and cost-effective. Furthermore, our trails only require a mere 6 – 8 inches of snow and we can start sledding. All of these features contribute to our longer snowmobiling season. And finally, Haliburton Forest, as a private organization, is also a professional operation, where all equipment is replaced regularly to avoid down-time, and staff are employed full-time and longterm. Many of our visitors know our groomer operators, one of whom has been running our grooming equipment since the late 1960’s! This creates a commitment to quality and service, which is hard to generate in a volunteer driven organization, where often the burden of a larger operation is carried on a few, unpaid shoulders. While this on the surface enables “cheaper” trail permits, it has its price in many other ways. I am troubled by the underlying quest for ever cheaper permit fees. Snowmobiling has its price. I accept that $49 for a day spent on a trail may be a lot for some people, where he/she can spend an entire season at $260 on other trails. But then, as outlined above, the dollars spent are not comparable to the quality of the experience purchased. The average snowmobiler will probably pay around $1,000 for gas and oil for his/her snowmobile and the truck that trailers it per season. He/she will spend $600 for insurance, similar amounts on other equipment, clothing and meals. Finally, a mid-sized snowmobile today retails for around $10,000 and needs to be replaced every 3 or 4 years. In total, snowmobilers are spending many thousands of dollars on their sport every season, yet the trail fees (at Haliburton Forest and also the OFSC), which not only provides them with the largest and safest network of trails anywhere, but also public insurance, lobbying and a voice, is being scrutinized. The effort to maintain and groom snowmobile trails is very similar to that of a ski hill. Yet, everybody accepts seasonal ski passes of $700 to $800 or more and daily permit fees in the $60 and $70 range. Many snowmobilers overlook the fact that the $260 OFSC season permit DOES NOT cover the cost of snowmobiling in Ontario! The shortfall must be covered by the 99% of Ontarians, who are not snowmobilers. Alternatively this shortfall will result in a decrease in services provided by the OFSC. Trails will not be groomed as often, the season will start later, equipment cannot be replaced when it should be and will break down more often. Finally, infrastructure projects to maintain and improve the trail system will not be undertaken. This scenario cannot be sustained for very long. Personally, I think it is time that snowmobilers pay their way and provide sufficient funding to the organizations, which not only stand for, but provide snowmobiling. The choice of trail quality and the snowmobiling experience in the end is theirs.